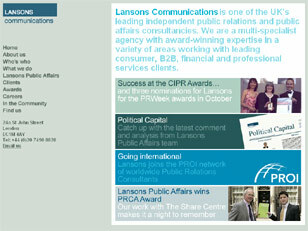 Lansons Communications is one of the largest independently-owned public relations and public affairs consultancies in the UK. London based, Lansons has a wide range of clients, particularly in the areas of consumer finance and financial services, as well as related areas such as property, law and ecommerce. The objective was to upgrade the existing Lansons website in line with their new design & branding guidelines, and to re-organise the layout & content throughout the site, providing them with a stage to showcase their clients over the years and showcase their achievements over the last 12 months. Lansons staff members would need to make regular updates to the site to keep it current and relevant to the ever-changing landscape of the PR industry. Windows Server 2003 hosting environment serving ASP web pages driven by MS SQL database. The Content Managment System was implemented using Microsoft Approved ASP.NET components, transferring the richness, useability and responsiveness of desktop applications to the web.